Like this, not a single client's update or reminder will be missed even when the support staff is not in the office. On the Dashboard, you will see "APP CENTRE" menu and under it, you will find "Google Calendar". Click on that button and Google Calendar App will get installed. Alternately, for uninstalling the app, go to Google Calendar "Overview" section then click on Uninstall button. 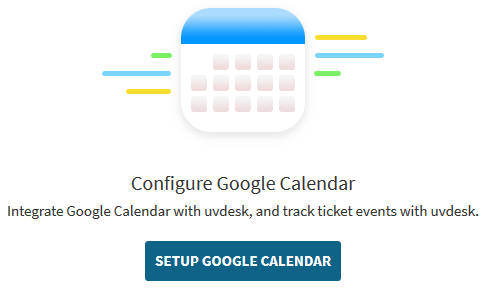 Under the "Configure", click on Setup Google Calendar button. 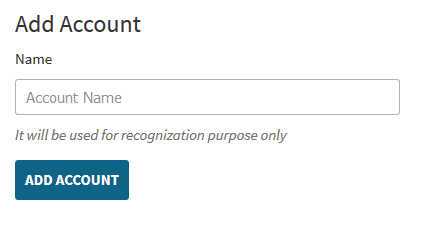 For adding an account, enter the name and then click on Add Account Button. 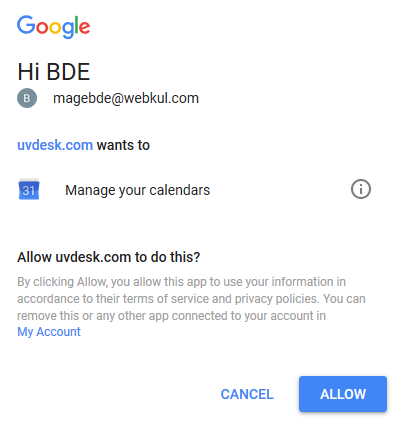 You will be redirected to log in your Gmail account and then it will ask for authorizing UVdesk app for calendar access. Allow the access and then Google Calendar App will be installed. Now, the support staff can go to ticket view page and they can see Google Calendar icon on the top right side. Click on the Google Calendar icon and then you will get a form to add an event. Enter event Title, location, duration and save it. If the Google Account is not added, then the agent will see Add Account link. After clicking on it, it will ask to log in and allow the Calendar access to UVdesk. 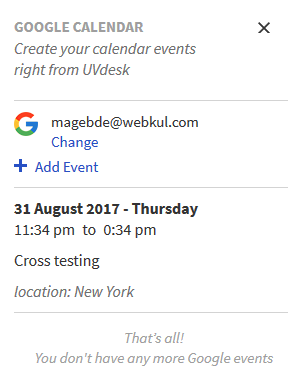 After that, the agent can add event or reminder via Google Calendar App.